If you are still looking for a Christmas whiskey, or perhaps a quick snifter for Santa as he passes through, The Irishman Cask Strength 2013 edition is just out. It's a blend of triple-distilled pot still and malt whiskey, all matured in ex-bourbon casks, just like Writers Tears from the same company. A couple of months back I described the new Writers Tears Cask Strength as a combination of 7 pot still casks and 5 malt casks. As I heard it, this new Irishman is 5 pot still casks and 7 malt casks. (They squeezed out 340 more Writers Tears bottles though, so I wonder if they really used the same number of casks.) Given the different proportions, it's interesting to try the two side-by-side, to explore the contribution of malt and pot still flavours to the mix. The two whiskeys are quite different; which is better is entirely a matter of personal taste. I sampled both at Whisky Live Dublin and preferred the Irishman, but a colleague of mine from the Irish Whiskey Society liked the Writers Tears more. At a recent Celtic Whiskey Shop tasting of "Christmas Whiskeys", it was my second favourite of the night, only pipped by Celtic Cask Cúig. 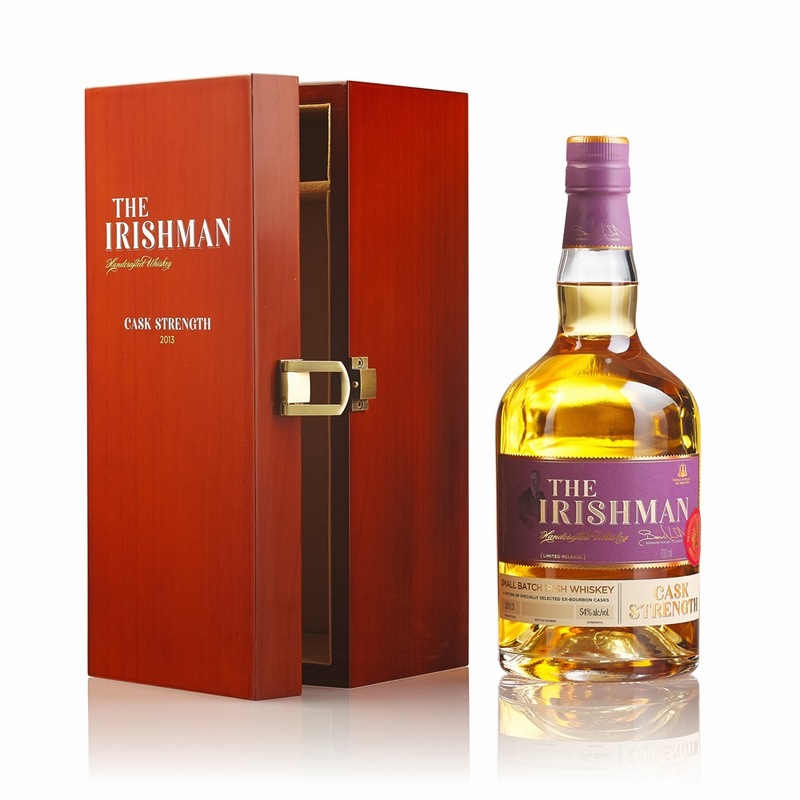 Since Cúig is €350 a bottle, that makes The Irishman Cask Strength a total bargain at €130! Cask strength here is 54% and, of course, it's non-chill filtered. There are 2,160 numbered bottles in this release.